If Jesus rose from the dead…everything is different! Below is a monologue I wrote and performed many years ago. I wrote it as if Mary, the mother of Jesus, is telling someone, early Sunday morning, what she witnessed on Friday, what she remembers about Jesus as a boy and what she thinks about hearing that Jesus rose from the dead. To hear the live audio version of this, you can click here then click the arrow on the slide above Session One: Faith, What is it? then click the arrow on the left to download the audio. Then with your cursor drag the marker to the end of the audio to 66:28 minutes, which you will be able to see on the left hand side of the audio file. They crucified my son Friday. His face was unrecognizable after they beat Him. The scourged Him and there was not one shred of skin left on His back. It was nothing but raw flesh. 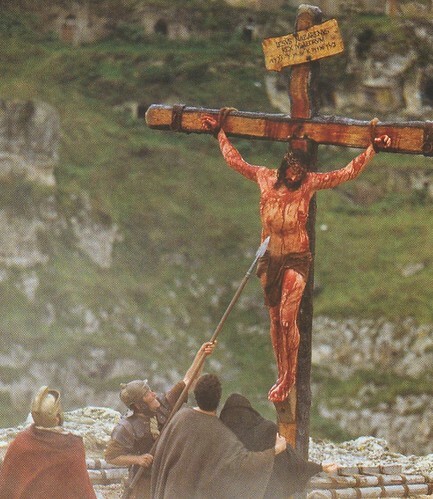 I stood at the foot of the cross and it seemed as if all I could see was blood…it was all just a bloody mess. I could actually hear His blood dripping on the ground with a splat. It’s odd what you think about at times like that, but I remember thinking it sounded just like rain slowly dripping off my roof, drop by drop, after a light shower. Honestly, it was too much to take in, to comprehend, to feel…the blood, the smells, the sounds, the sight of my precious Son dying before my eyes and I just kept staring at His hands…. Those hands…they used to touch my face when He was just a boy, “Mommy, mommy,” He’d say as He stroked my cheek. They nailed my baby’s hands to that cross! Once when we were at a wedding in Cana the wine ran out and I saw those precious hands point to empty water jugs, when He told servants to fill them with water. When they took some out to taste, it was no longer water, but the finest wine imaginable! He did that with His hands and they nailed those hands to that cross!! In Galilee I saw Him take a few loaves and a few fish into those hands and bless them and then He just kept handing them out to feed thousands! But they nailed those hands to that cross! Did you know Lazarus? He died not too long ago. He was rotting in a tomb, but after four days, my son Jesus walked up to that tomb, held up His hands and said, “Lazarus, come forth!” And a dead man came walking out of that tomb alive! But my Son is dead! Now He is rotting in a tomb because they nailed those hands to that cross! Mary Magdalene told me she went to His tomb early this morning and it is empty! She told me she saw Jesus alive! Jesus, alive? I don’t know if it is true. I don’t know! But I will tell you this, if it is true, everything has changed. Everything. Nothing will ever be the same again if Jesus did rise from the dead! My friend, my precious friend, Jesus did rise from the dead. He is alive! He is not dead. And because He lives everything is indeed different. If you have put your faith in Him, meaning that you believe you are a sinner worthy of death, but that He took your place on that cross, then you are a new person. He lives in you and you can now live a completely new life by His grace. May you go in peace today to love and serve a living Savior! May you be filled with the knowledge of His grace and His power at work in you! He is risen! Jesus is alive and that changes everything! Now go live like it!